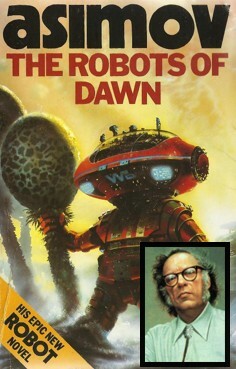 Isaac Asimov (1920-1992) was one of the most influential writers of all time. Famous for his science fiction, he also wrote mysteries, fantasies, and popular science — and published an astounding 500 books. “The answer is simple: I don’t know how I do it! I haven’t the faintest idea! I only know I’ve been able to do it since my teen-age years without being taught in any way. Today, of course, there’s great excitement about Machine Learning and Artificial Intelligence (AI) being able to “write the rules” for real-time decision-making in RA/fraud assurance. However, these advanced technologies, by themselves, are merely tools for innovative human brains to employ. Without smart thinking, tinkering and bold risk-taking, cool technologies never live up to their hype. Back in 2006, for instance, AT&T, BT, and NTT had all the comms and computing technology needed to commercially launch cloud computing. But they didn’t make it happen. Likewise, the big tech firms sat on the cloud computing opportunity. But along came Amazon — then an $11 billion on-line retailer — who single-handedly made cloud computing a commercial success. The practical geniuses at Amazon conceived, trialed, invested, deployed, and made-money in cloud computing — and Amazon remains the market leader today, owning about one-third of a market that’s growing 50%+ a year. Amazon’s success has some lessons to teach telecoms as they grapple with AI, Machine Learning, and robotics. Once again, the tech components are available and rapidly becoming mainstream. But the question remains: how can an operator plot a course to success? How exactly do you: make the right tech decisions; develop better processes; and groom internal experts to rapidly deliver a stream of on-demand solutions that leverage AI, ML, and robotic technology? But what you can do is read how Tony Sani and his team at the MTN Group in South Africa are tackling this advanced fraud/RA problem head on — and racking up success stories as they grow their program. Luke Taylor of Risk Rewards attended Tony’s illuminating presentation at the recent RAG Conference in Nairobi, Kenya. And it was Luke who urged me to speak with Tony and arrange for the hour-long Skype call we had to discuss Tony’s story. This discussion is unusually long: over 4,800 words! But I’m sure assurance experts are going to love it because the topic is timely and there’s lots of strategic material to absorb. Tony begins by giving a quick overview of MTN’s business: its group telecom business (across Africa/ME), key RA/fraud control challenges, and MTN’s significant non-telco stakes in banking, content, and on-line retail. He then explains how in 5 years’ time MTN took its RA/fraud assurance from very high leakage to below 3% per year. That operational success sets up the meat of our conversation: the journey MTN is taking to insert “exponential” technologies (AI, robotics, and ML) in its RA/fraud assurance program. Tony (and his Innovation Partner, Danie) detail the thinking processes, decisions, examples, and lessons learned as they planned, trialed, and are now steadily rolling out their innovations. Luke and Tony also muse about the challenges and opportunities in partnering with RA/fraud solutions vendors — and even the big tech firms. Another — not to be missed — topic is the RA/fraud team’s initiative to take its homegrown expertise into supporting many internal customers, both inside and outside the telco business. Dan Baker, Editor, Black Swan: Tony, Danie, and Luke, thank you for agreeing to meet to discuss MTN’s work on innovation. Please introduce yourselves. Tony Sani: Dan, I’ve been with MTN for the last 5 years and I look after the group revenue assurance and fraud functions. And I’ve been doing telecom RA and fraud for the last 20 years in the U.K. initially at T-Mobile. I did some time with Cable & Wireless and MCI Worldcom. I then consulted for eight years with various recognized telecoms organizations including Vodafone, Telefonica, Bell Canada and MTN. Danie has been part of the journey here at MTN in different guises for about the same time as me. Danie Maritz: Hi, Dan. I’m here at a company called Moonshot, an innovation consultancy. We specialize in solving complex problems working with design thinking and exponential technologies. 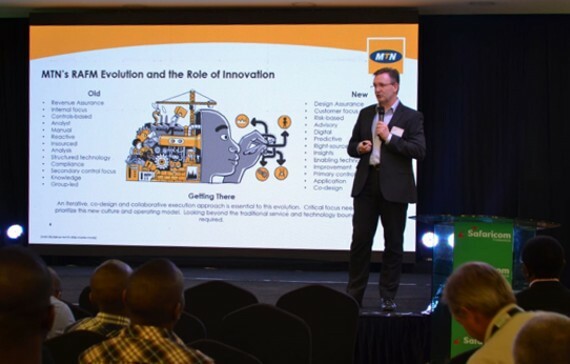 MTN is such a great company to work with, and being in Africa there’s quite a bit more freedom to try new things out and implement the latest technologies. Luke Taylor: Dan, l first met Tony and his team when he joined MTN. And I know all the great things he’s done at MTN in his tenure, which has been reflected in him being nominated for a Risk Reward Award Lifetime Achievement Award. So I was keen on setting up this Black Swan chat and seeing Tony’s innovative ideas published to a global audience to provide a benchmark for innovation in this arena. Great, guys. Tony, it would be great if you could give us a quick backgrounder on MTN’s business. Tony: Well, MTN is the biggest group company in Africa and the Middle East with 250 million subscribers, over 10 billion dollars of turnover with 35% EBITDA margins and significant presence in the digital space. Many will be surprised to know we have over 100 non-telco businesses in the Group. We sell more books than Amazon, and are bigger than Uber in Africa. We are also the second biggest online retailer in the Middle East — and the biggest provider of digital entertainment on the continent. So Africa is certainly a growth market and it’s a great market to be working in because it’s mostly greenfield: there’s very little in the way of existing infrastructure. For example, about 80% of Africa is unbanked, and yet MTN is now the largest bank on the continent, and that’s a huge growth area for us. And what’s business look like on the telecom side? What are the key challenges you face in fraud and revenue assurance? MTN’s telecom business is very diverse. We’ve got fixed line, mobile and obviously our digital businesses. In terms of revenue, the majority of it comes from prepaid GSM and of that, it’s probably 70% voice, 10% SMS, and 20% data. And our leakage risk mix are pretty much in line with our revenue mix. On the fraud side, like most operators in our region, we are at risk of bypass (SIM box) leakage, and you’d expect that since the arbitrage opportunity in African countries is quite high. Overall our leakage risk is caused by roughly 60% RA-related issues and 40% fraud. Our biggest leakage risk is experienced in the provisioning and network usage processes, which is consistent across RA and fraud. On the mobile side, the indirect nature of sales channels in our markets contributes to our risk. 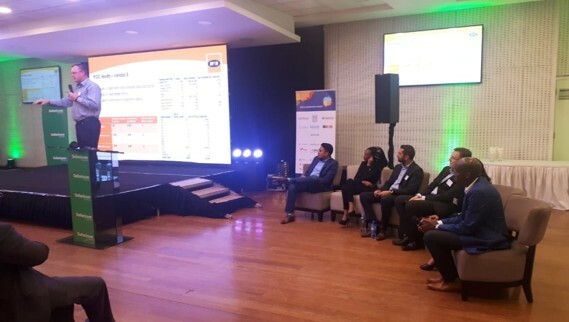 South Africa and Cyprus generally follow a postpaid centric, direct channel model , however the rest of our markets are largely prepaid where indirect sales channels accounts for about 90% of sales. Lots of diligence in fraud detection is needed to assure this type of channel mix. You can imagine in some of the rural areas in Africa, the dealer is a person who stands at the corner of a street, so that brings some unique challenges. When I came back to South Africa from Europe, I soon realized that the type and level of fraudster activity in Africa is significantly more complex than what you’ll find in other markets. We are certainly evolving quickly in a digital business direction, which means we have to manage our legacy revenue streams and new digital revenue streams at the same time. I understand a lot of effort was put into increasing the maturity of the assurance operation. Can you explain some of your team’s challenges and successes? Dan, our journey began in 2013 with a very small team — three people coordinating activities across 21 businesses in the group, with limited standardization in methodologies or technologies. In our first phase we focused on building awareness and educated the business on the size of the problem, as well as putting some basic methodology and infrastructure in place. Since the leakage levels across the group were not prescriptively measured before, we initially did a full 21-country financial risk and maturity assessment. This informed us we were incurring high leakage losses with improvement needed in capability. The quantified leakage figure got a lot of people’s attention, and helped to motivate for investment to build a stronger centralized group team and we brought in experienced, international resources to help develop the group team. We invested in technology, put in place a basic risk and controls methodology, introduced standardized leakage measurement, and started improving the RAFM controls environment. We also rolled out standard RA and Fraud testing capabilities. We also funded and ran close to 50 projects from the group team to find and manage leakage over an 18-month period, which resulted in some healthy returns from those tactical projects. Soon thereafter we were able to demonstrate the value that RA and fraud control could bring to the business. So, by the end of 2014, we were able to reduce leakage levels to a more manageable level. Then, in our second phase that began in 2015, our focus was to build a more inclusive revenue assurance and fraud community — to get controls implemented closer to the system and process owners. We introduced and supported the implementation of a primary controls environment, which with the RAFM controls, formed part of our “combined assurance” approach. We improved awareness and educated everyone across the business to contribute to delivering better revenue assurance results. Supporting our smaller businesses with a shared service model for controls performance. So, by the end of 2017, we saw lots of progress in integrating the philosophies of RA and fraud across the business. Now we set ourselves a target by 2021 to reduce our leakage to below 3%, which is typically what one would find in a mature market. For leakage, we measure the impact of all risks from product development, sales ordering, provisioning, network usage, rating and billing collections, revenue recognition and partner settlement, which covers our end-to-end revenue streams. Like most telecoms companies, the added complexity is we need to manage this in a fast changing and dynamic environment which requires you to constantly enhance your detection methods and controls. Nonetheless, we’re at the point where our entities are managing their RA and Fraud responsibilities at a CMMI maturity level between 3 and 4. We’ve also up-skilled our organization, which for a developing market business is a priority. We’ve invested in and built an RAFM academy, which provides online training and evaluation content, which we are now sharing with the Risk and Assurance Group’s learning initiative. Wow, congratulations on this achievement, Tony. The maturity improvements are impressive. And I think it’s important you walked though that because it sets the context for why you decided to broaden the scope of your team’s mission to take it to a higher level and also to serve other parts of the business. Yes, as we thought about the future of our assurance team and operation, we knew we wanted to build a program we could sustain this level of assurance over the long term. We also wanted a capability that would enable us to continue monetizing the benefits of RAFM, which required us to look at more innovative ways of managing our RAFM capability. We saw ourselves evolving beyond serving RA and fraud problems alone, to support other areas of the business solve their complex problems. For instance, we knew that key focus areas like compliance and customer experience face similar challenges in detecting and managing risk in a highly data-driven environment, and therefore asked why not enable our team to support other areas like these? We also, as an RA and fraud community, knew we needed to become more insights- and improvement-driven. But to do that required investing in new ways of thinking, working and technology use, which we had to understand and embrace. Robotics was an obvious area because it helps us improve the automation levels for our standard control environment. We also saw machine learning and AI as crucial to improving our effectiveness and enabling us to be more predictive in detecting and preventing fraud leaks. Invest in tech that could exponentially improve our effectiveness. How did you staff the innovation team you were building? Well, to be honest, we’ve had a few false starts in building the innovation capability. We originally planned to create a dedicated innovation team by assigning subject matter experts (SMEs) to the team from various parts of our operations. But we soon realized that would be impractical for a couple reasons. First, those SMEs are still needed in operations. And second, if we restricted our innovation to a small team, the culture of innovation wouldn’t really change and we would miss the opportunity to make innovative thinking part of our routine thought process and ways of work. When we began the innovation program, our emphasis was on new and exponential technologies that we could introduce. But we matured our thinking and discovered that the bigger innovation opportunity was to change our skill sets, mindsets, and methodologies. We basically needed an integrated way to continuously improve and manage change through successful innovation prototypes and programs that support our growth strategy. With the support of Danie, an expert in innovative thinking and processes, we have successfully completed the first phase of our innovation projects. Danie, can you explain how you and your team helped Tony innovate and improve the skills and value of his team? Danie: Well, after maturing the RA/fraud operation and putting it on a stable footing, Tony called on us to bring so-called “exponential technologies” into the picture. The idea was to insert some of the systems agility and analytics smarts that the Googles, Microsofts, and Amazons are famous for. We know that revenue assurance’s future challenges will take many different forms and shapes — and the solutions required won’t be as simple as they once were. So the idea is to get ahead of the disruption curve by applying robotics and AI tools with a goal to redesign business methods to accelerate assurance work and accomplish more with less. We started by looking at the strategic challenge or growth strategy that Tony and his team were working on, and around that we defined several “strategic breakthrough questions”. We do basic education on the technologies and then train the innovation team in framing the strategic questions, design thinking, agile and lean startup methodologies. I must say that employees, especially the younger ones, are lapping this stuff up. At first, the older folks didn’t understand where we were going, but gradually they came onboard. And we are on our second wave in our journey. A lot of the training is around stimulating imagination, and teaching them to thinking differently. The goal is to redesign a process or user interface that we can systemize. Then we re-validate before creating a prototype, something that can be further refined and scaled up when it’s deployed. For example, in the fraud detection side, my team might analyze operational data to find the root cause of an active fraud leakage problem. Then, come Monday morning, an analyst on Tony’s team takes our analysis — and on a fast-turnaround basis — builds controls to minimize the leakages and make sure we don’t experience another major revenue loss in that same area. Now at a task level, it’s a matter of figuring out what can be automated and then bringing in robotic software. In the end, you’re executing in 3 seconds what a fraud analyst would normally require 15 to 30 minutes to work on manually. This is an example of applying robotics to do automation, whereas we are currently also working on using block chain, machine learning and artificial intelligence to exponentially solve complex problems that legacy technologies are not designed to do. So as you can see, robotics brings enormous value because it frees up analyst time to do more strategic or more urgent work. Large scale digital transformation is a trend people have been talking about for a long time. But bringing the digital culture to RA/fraud assurance is something pretty new. Tony: Dan, driving digital is core to our business and it is indeed a big cultural shift. By applying robotics to the core part of the business, your cost savings and cost improvements are indeed exponential. In an operation like Nigeria that generates significant volumes of data every day, it is essential to have the latest technology with high levels of automation to tackle this complex problem. While we have made a good start in the program, we’ve still got a long way to go. The whole idea is to bring different technologies in and redesign ways of doing assurance, risk mitigation and control. Yet to achieve true exponential breakthroughs, we need to really challenge the teams to solve problems with design thinking, agile and lean delivery methods within an environment that encourages innovation. It’s all about continuous improvement and experimentation. We solve problems by designing, redesigning and systemizing processes. How would you compare the agile way to what you did in the past? Well, the past model for investment and delivery was to have consulting companies come in to tell you where the problems are. You then build an investment case, sell it to the organization, select the vendor, and it takes a long time to implement. By the time you have it implemented, the business has changed or the business problem has changed. 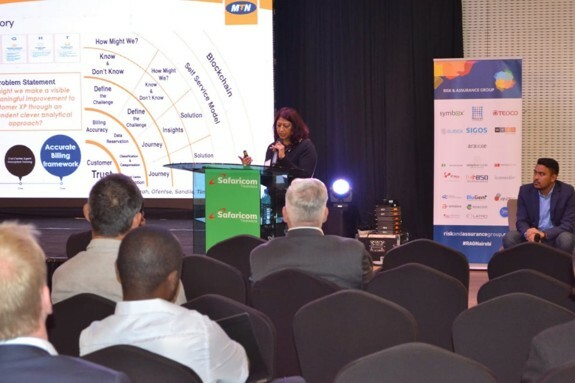 But with the pace of change in the world today — and fierce competition from the likes of OTT players — telcos have to be more agile, which MTN is doing through many of its digital businesses. Another thing we’re sensitive to is avoiding a group company-imposed solution model for RA and Fraud. The model for success in innovation within a group company is to co-design and implement solutions that can easily be localized for each market by the local teams because they understand the local operation far better than we do. The key is to have our OPCOs involved in innovation from the beginning. As a rule, we expect every pilot project to get at least one local operating team involved. We actually implement the use case prototype within the OPCO. When you do that, you are able to improve the delivery success and improve from lengthy consulting and technology implementations to something far more rapid and agile. Can you give me an example of where these fast prototyping techniques are working at MTN? Let me share a couple examples. Applying machine learning to solve SIM-swap fraud is a good success story. In the past, RA and Fraud teams would typically investigate SIM swap fraud from the view of one data point: complaints or exceptions in the ordering process. But machine learning allowed us to employ multiple data sets and find fraud patterns our traditional fraud system were blind to. We found, for example, that 30 minutes before 80% of SIM swap frauds took place, the services were suspended. That led us to realize that syndicates at work had a certain modus operandi that we could then disrupt and mitigate. We settled on two projects, one for internal customers (our stakeholders) and one for the external customers. We said, “Look, the sensible way to start is to build greater billing accuracy”. Billing accuracy is something RA worries about. Well, how about applying that to the customer experience? If we reduce billing accuracy by X%, how big an impact will that have on our net promoter score? Getting an answer to that question was very useful to the business. I can see where turning your RA team into a kind of innovation factory makes coming to work in the morning a lot more fun. Dan, one of our biggest rewards was seeing the change in people. As Danie said, many of the youngsters in our graduate program have really embraced the new way of doing things. They embraced the technology and we soon notice improvements in the team’s skill sets and results. Executive team makes final “go” or “no go” decision on investing. One of the challenges one faces is how to best utilize these new technologies across various functions in one’s business. 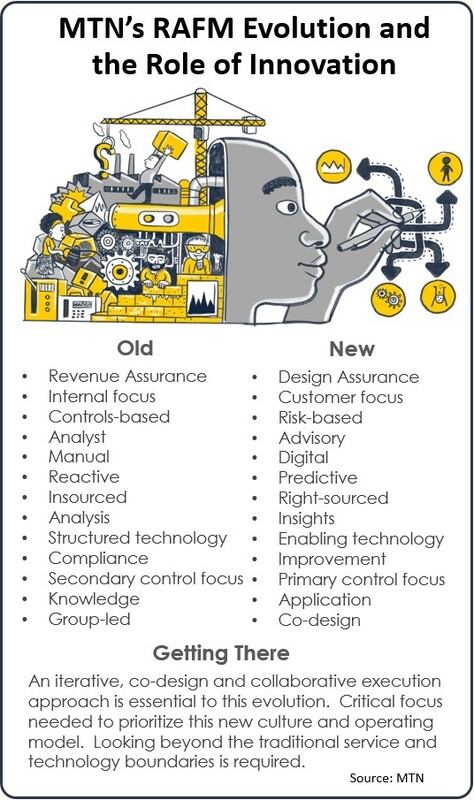 There was some resistance to change and some areas were more ready than others to embrace these new technologies. For instance, there are risk and security teams at MTN interested in robotics use cases too. So we now team up with those teams to propose cross functional use cases to the investment board. Likewise, we’re now setting up a cross-functional center of excellence team for a roll-out of robotic technology. How well are RA and fraud solution vendors addressing your needs? We certainly understand the business problem a lot better than our vendors do, but our vendors have a better understanding of the technologies. It’s maybe a challenge for some of the traditional RA and fraud vendors to evolve into the space. It requires a very different approach: a different business model is needed. The way the traditional RA vendors tackle problems is using a very structured approach, and most of their revenues are still generated from traditional technologies and services. The time-to-deploy an RAFM platform — usually 9 to 12 months — is too long in the current environment. With rapid prototyping, you get benefits much sooner. Analytics is important, but it has failed us in the past. And a key reason is that it’s treated as a platform as opposed to a solution. The vendor’s scale is another factor. When you talk about exponential technology, smaller vendors may not have that scale. Do they have the scale to meet all of the requirements of a large group company in terms of insurance, liability, and security compliance? Luke, having head up one of the leading RA/fraud vendor companies for a number of years, I’m curious to get your perspective. Luke: Dan, I think these are exciting times. We can no longer rely on the traditional fraud and revenue assurance tools because technologies, services, and industries are moving forward too fast. As Tony says, we need to be more agile in our offerings and deployment. It’s a risk to deploy monster platforms because two weeks later those customer services could change and new strategies arise in the business. And agility means inserting smaller, more-targeted solutions that you build much quicker and can demonstrate quicker return on investment. And it’s using these advanced technologies to boost productivity, accuracy, and operational insights. When you get that to work, fraud and revenue assurance no longer has to be so reactive. You become proactive. The other major shift is toward more business assurance. You look less at revenue loss, and more at how to use this information being digested by these systems across the different departments and business units to provide better insight, intelligence and business benefit. And when you do that, you also get better buy-in for investing in the technology from the broader business. Fraud and revenue assurance vendors have to change and they haven’t. To be honest, they’ve been quite static. They delight in having a platform that crunches big data, but it still takes a long time to groom those systems to be productive. Data accuracy is another issue: junk in, rubbish out. We simply must have substantiated data. MTN is headed in the right direction. It’s utilizing new technologies alongside more traditional approaches, looking towards agile — sprint-like — methods to problem solving. That’s a great inspiring move forward. Agility is, of course, a hot IT trend. Companies like Pegasystems have designed their CRM framework to be highly customized and quickly modified without interfering with the legacy code. But large IT vendors are generally not interested in pursuing specialized solution areas. So that gap can be filled by the internal assurance/innovation teams of large operators. Tony: I don’t think you can completely replace what you have in the short to medium term. You still need to structured controls in place that run every day and monitor specific scenarios. In that area, the traditional vendors are quite good. But to respond to things that are not in your line of sight, or changing business models, or changing fraud types, a slightly different approach is needed. Over the medium to long term, I see the big data, ML and AI players starting to play in this space. In a recent RFP, we invited both traditional RAFM vendors as well as Big Data technology providers. Now while some of the Big Data vendors were interested and their technologies could support us, they had very little competence in our domain. For that reason we decided to select a vendor with existing domain technology and expertise. But this will change as the exponential technology vendors build the competence and understand the opportunity. The question is whether they will invest enough in this domain to be good at it. I think the jury is still out in that. Tony, this is great perspective. Thank you for spending the time to brief Black Swan readers on how you’re implementing innovation. I especially like your idea of expanding the scope of your team’s work to serve the wider company. The overriding objective of our innovation program was to create a different way of doing things — and to also create new opportunities. We really see the RA/fraud teams of the future becoming an internal advisory business. But to do that you’ve got to be supported by technology that helps to better automate one’s controls environment, that frees you up to create insights that can help drive improvement. The real benefit an RA/fraud assurance mindset brings to the table is an understanding of how the business functions end-to-end. That’s a crucial asset when you consider most other parts of a telco business have only a partial or siloed view. Certainly we assurance professionals need to “up our game” by becoming more data-driven — and more insights-based rather than audit-based. When you come along and do an audit, a year later you come back and you check to see that the problems still exist. That’s not sufficient anymore. The right approach is a more continuous, data-driven one. By combining an assurance mindset in a very data rich-environment with new ways of design thinking supported by exponential technology, you can solve problems you couldn’t solve before. 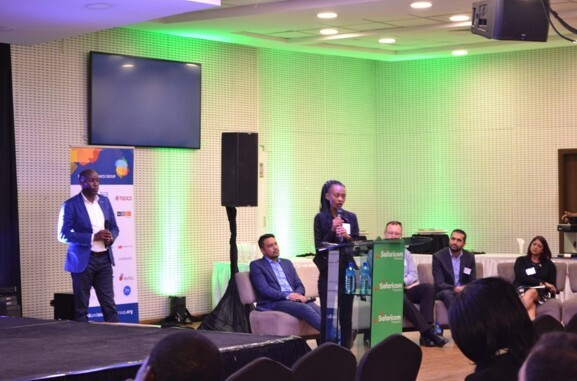 For example, mobile money brings many new challenges in combating anti-money laundering and Know Your Customer (KYC) regulations. A traditional telco business isn’t well equipped to support that requirement and therefore has to evolve. So I think we’re working in a very exciting space. The methods, mindset, and skill sets that RA and fraud pros have can add lots of value across a broader spectrum of domains — even across other industries. How do we do RA and fraud for our financial services business? How do we do RA and fraud for insurance? How do we do it for online retailing? The fortunate situation we have here at MTN Group is that all those revenue streams are inside the company. The opportunities are tantalizing. Tony Sani is the Executive in charge of Group Revenue Assurance & Fraud Management at the MTN Group headquartered in South Africa. Anthony was born and educated in South Africa, having completed his tertiary education with a degree in Accounting Science and is a Certified Systems Auditor. His professional career over 15 years includes extensive experience in the Telecommunications and Petrochemical industries. After 5 years with Shell Gas (UK), Anthony’s early telecom experience with MCI in London included the establishment of a Billing Integrity and Data Quality domain, as well as managing the implementation of a European-wide ERP solution. In 2000, Anthony joined T-Mobile UK, where he spent 4 years developing and Heading the Revenue Assurance, Billing and Carrier Services organizations. Anthony joined Cable and Wireless in 2004, and implemented a Revenue Assurance Group organization and capability across the 33 operating entities globally. Returning to South Africa in 2006, Anthony established an advisory business, including international clients such as Vodafone, Telefonica LATAM, Bell Canada, Zain and MTN. During this period, Anthony led many OPCO and Group-wide financial improvement and capability development programs in Revenue Assurance, Fraud and Business Intelligence. Danie Mariz is the managing director of Moonshot Pty (Ltd) and the co-founder and director of the Institute for Exponential Manufacturing. He is an organisational psychologist, innovator and business entrepreneur. He completed his internship at Koeberg Nuclear Power Station in 1992 and was CEO of Productivity Development from 1996 — 2004 and transformed this company into BEE enterprise as Group CEO from 2004 — 2010. Then he joined Deloitte as associate director in 2011. Danie started-up and led the Next Generation Collaboration practice at Monitor Deloitte in South Africa. He facilitated over 300 high level executive strategy sessions for top tier organisations in this role. As a leadership, innovation design and strategy expert he brings a distinctive accelerated collaborative approach in solving, improving and transforming complex problems. Danie engages directly with the C-level executives at large and complex organisations in all industries including the public sector to facilitate and design strategies that are easy to implement, measure and report on. Danie is dedicated working with futurists and industry leaders on social innovation projects for the good of the country and the African continent. Luke is a seasoned business executive with a deep knowledge of telecoms fraud management and business assurance from his 20 years in the industry working for a risk management software vendor. He founded Lateral Alliances in 2017 to offer business management and consultancy services focused in the IT sector and specifically telecoms risk management.